Pelvic floor exercises are more effective than ever with this Kegel8 approved gold plated probe! 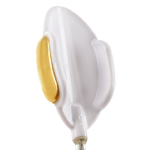 Nickel-free with wonderfully conductive gold plated electrodes, the Perisphera AT vaginal probe is ideal for use with your choice of electronic pelvic floor exerciser. This dual channel probe is particularly suitable for women who have vaginismus or find it difficult to insert probes. Its slim design makes it simple to use. At only 11mm in diameter, the probe features an adjustable flange so that you can change the depth and angle of insertion. There are 4 electrodes on this probe, arranged in pairs at the top front and bottom rear ends. 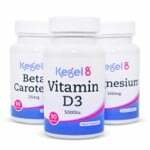 When used with your Kegel8 or Neurotrac pelvic toner it stimulates your perivaginal muscles via dual channel EMG biofeedback. 120mm in length, the probe is made from biodegradable plastic that’s smooth and gentle on your body. It’s best used lying down, allowing you to relax while you exercise your pelvic floor muscles. 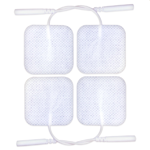 The Perisphera AT is compatible with EMG biofeedback or EMS machines using two or four wires. It is supplied with 4 connective leads that are 20cm in length with 2mm female sockets, ready to connect to your EMS or EMG device. Your probe will come in a sealed bag with instructions. It must not be sterilised or autoclaved; washing with mild soapy water after each use is enough to keep the probe working perfectly and hygienically. It’s a CE mark medical device class 2a. Made in Italy by the pelvic health experts at BEACMED, the Perisphera AT will help you to get the most out of your Kegel8 or Neurotrac machine.